Apple’s iMovie is a great introduction to video editing. It has simple menu options for transferring your finished video to DV tape or DVD disc, but exporting a full-quality Quicktime clip of your movie takes a few extra steps. The designers probably didn’t expect beginners to have an obvious need for such a feature, but it’s a good trick to learn. Step 2. 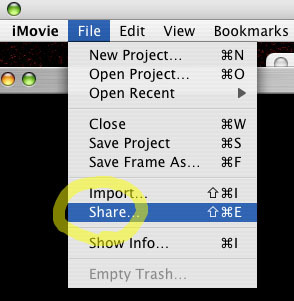 Choose Full Quality DV from the Quicktime panel, and save your file. Step 3. The resulting file’s name will end in .dv. You can go ahead and change this to the standard .mov, if you prefer.